Newly-promoted Leicester City's owner wants a top-five finish in the Premier League within three years - and will spend the money needed to get there. 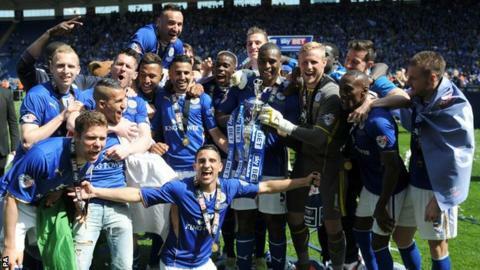 The Championship title winners have returned to the top flight after a decade-long absence. Billionaire Thai chairman Vichai Srivaddhanaprabha outlined the club's next steps to reporters in Bangkok. He said: "It will take a huge amount of money, possibly 10bn Thai Baht (£180m), to get there. That doesn't put us off." Srivaddhanaprabha added: "I am asking for three years, and we'll be there. "We won't take the huge leap to challenge the league's top five clubs immediately. "Do we have a chance to beat them? Yes, we have, but I think we need to establish our foothold in the league first and then we think about our next step. Nigel Pearson's side collected 102 points on their way to landing the Championship title. And the manager shares his chairman's optimism. "The important thing is we're going with a belief that we can achieve," he said after showing off the Championship trophy to fans in the Thai capital. "It's important we continue to improve everything about ourselves. So, we can challenge for the top five. But, of course, one step at the time." Leicester have qualified for Europe three times, most recently as the 2000 League Cup winners. They went out of the 2000-01 Uefa Cup in the first round, losing 4-2 on aggregate to Red Star Belgrade of Serbia. Srivaddhanaprabha's consortium took over at Leicester in 2010.